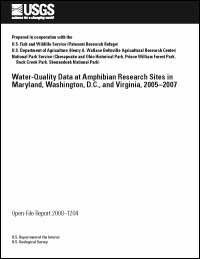 Data on the chemical composition of water were collected at least once from 47 amphibian research sites in Maryland, Washington, D.C., and Virginia, from 2005 through 2007. One hundred twenty-five water samples were collected from vernal pools and streams and analyzed as part of long-term monitoring projects of the U.S. Geological Survey Amphibian Research and Monitoring Initiative in the Northeast Region. Field measurements of water temperature, specific conductance, and pH were made. Laboratory analyses of the water samples included acid-neutralizing capacity, total Kjeldahl nitrogen (ammonium plus organic nitrogen), nitrite plus nitrate, total nitrogen, and total phosphorus concentrations. Field and laboratory analytical results of water samples and quality-assurance data are presented. Suggested citation: Rice, K.C., 2008, Water-quality data at amphibian research sites in Maryland, Washington, D.C., and Virginia, 2005–2007: U.S. Geological Survey Open-File Report 2008–1204, 12 p.
For more information, please contact Karen C. Rice.